-- It's no secret that I openly question the goings on with the CFL on this blog. I believe this league could be so much better, but they keep doing things to hurt themselves. Some of them are things I don't think they have control over, yet they get the blame. As it is with many things, when the league does something good, they should be recognized for it, and I think they have the potential to have hit a homerun with CFL Week which was announced Tuesday at the Great Canadian Brewhouse in Harbour Landing. Putting on a showcase event in the middle of the off-season is a great idea. There are many things planned to keep the CFL front and center on the minds of football fans during late March. It will come at a time before the MLB season starts, and the NHL and NBA regular season will still be on meaning the focus won't be on the playoffs. The NFL will be done, so there is no worry about that league. The key now is to make sure there are no glitches and that everything runs smoothly going into year 2. If the CFL can show in the infant year of this initiative that it works and it can be done properly than they have the chance at having something which will be tremendously successful. Of course, this won't work in all markets (Toronto, Vancouver, Montreal), but I think it can succeed in the West along with Ottawa and Hamilton. I also wouldn't mind seeing the league taking its show to places where fans don't see the CFL up close and personal like the Maritimes, Quebec City and Victoria. From coaching clinics to autograph sessions to dinners to the combine, it sounds good in theory. Let's see everything get rolled out. I'm confident this can work if the league puts enough resources into it and its promoted properly including their TV partner. I didn't see Sportscentre on Tuesday night. How much publicity did TSN give the event? -- As the head of officiating, how much time does Glen Johnson spend in the Command Centre? -- If TV ratings for the first weekend of CFL playoff games were up substantially from last year, does it mean we won't see infomercials for frying pans and those two annoying women hawking the 3D Crystal this weekend? I find it atrocious that TSN has to run those ads during CFL games. Are they on during the Sunday or Monday Night NFL games? Are they on Saturdays when NCAA Football is on. I don't know the answer to that because I'm not paying attention. -- Seems to me as if a lot of people are already saying it is going to be a Battle of Alberta at the Grey Cup. Talk about disrespect to the Lions and REDBLACKS. More so to Ottawa than BC as I can understand most everyone thinking the juggernaut that is the Calgary Stampeders will move on to the big game. I won't be surprised to see a BC-Ottawa Grey Cup, but I will say that at least one of those teams will be playing a week from Sunday. 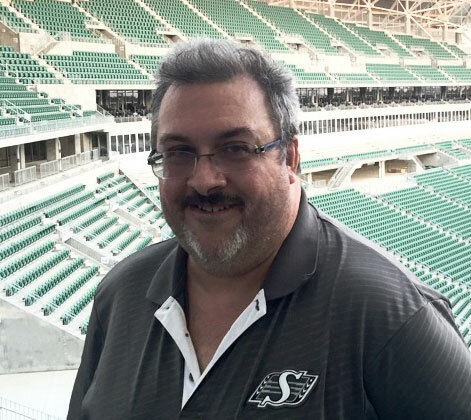 Let it also be said, an Edmonton-Calgary Grey Cup will make this Saskatchewan blogger somewhat nauseous. -- Kerry Joseph has gone to Twitter telling the Riders to pay Darian Durant what he deserves, and so has Naaman Roosevelt. Who else is going to put their two cents in the efforts to convince Chris Jones to keep Darian in a green-and-white uniform. I'm still optimistic he is back, but that optimism has waned somewhat. He is apparently still in Regina though which is a good sign. I thought he would have it high-tailed it back to Atlanta. Perhaps he will once he has put pen to paper. -- The Regina Pats continue to be the talk of the city and for good reason. The play of John Paddock's proteges have everyone buzzing, Why wouldn't they as they have completed the first quarter of the season with a "0" in the loss column. They must be playing too well though because there are many who can't be content with enjoying the ride. They have to find a whipping boy to make themselves feel good, and that whipping boy is apparently Tyler Brown. Many feel the goaltending position needs an upgrade. Many need to give their head a shake. No one had a problem with Brown when he helped get the team to Game 7 of an Eastern Conference final. No one had a problem with Grant Fuhr when he was making saves for those great Oiler teams that the current Pats are being compared to. The games will get tougher for Regina as the season wears on and the playoffs will be a battle as Regina attempts to bring home the Ed Chynoweth Cup. I'll be shocked if the Pats don't go into those playoffs without Brown and Jordan Hollett patrolling the pipes. If this team needs an upgrade, and I would just call it a case of making a strong group even stronger, I would find another d-man to compliment Hobbs, Zborovskiy and Harrison. I'n not going to sit here and tell you Brown is an elite WHL tender because he's not, but he is more than capable of doing the job. By the way, if looking for a d-man, here are three names I will throw out there---Brendan Guhle (PA), Caleb Jones (Portland), Ethan Bear (Seattle). The question is what is the price tag for one of those three. They won't come cheap, but the Pats have some assets. -- Still with the Pats, they are gone because of Agribition and this year's event will see usage of the International Trade Centre which still isn't completely built. Phase 2 of the ITC will mean the demolition of Exhibition Stadium---the first home of the Pats. That is where I saw my first Pats games. Exhibition Stadium has a lot of memories inside it. It isn't the same as Taylor Field, but before that wrecking ball goes through, someone should take note of some of the activities which occurred in that place. I am guessing you don't really want to step inside of that place though for fear of having your foot chewed off by a rat or something. -- The Dallas Cowboys are the story of the NFL season at 8-1. The reason for this is the play of quarterback Dak Prescott and running back Ezekiel Elliott. Can one be named MVP and the other named rookie of the year. FWIW, I would put Prescott in the MVP discussion ahead of Elliott. -- Is it just me or is Tyler Bozak quietly having a good start to the NHL season. The Leafs forward and Regina native is averaging almost a point a game for Toronto. -- The LP's Rob Vanstone asks when the MLS season ends? I second that. This Toronto FC-Montreal Impact game playoff game has been hyped forever and it's just a semi-final isn't it. -- Two thumbs up to the owners of Victoria's Tavern and the two Leopold's Taverns in Regina for instituting a free ride program and teaming up with a designated driver service in December, They see what a problem drinking and driving is in Saskatchewan and they are doing something about it. Let's hope other bar owners follow suit and they make it a year-round thing. -- Safe to say you don't want to get on Kate Upton's bad side after her tweets following Justin Verlander getting beat in the American League Cy Young vote. How do ya really feel Kate? -- High Impact Wrestling is at the Hungarian Club tonight. Gronkville assembles for their monthly meeting, How many of them will bathe before attending! I'm guessing at least half, but that may be a little high. That's all I got. Have a great weekend! We might actually get to December without snow! Brown isn't an elite goaltender, but he is a servicable one. I agree the Pats can win with him in the lineup, but if you could upgrade why not. As long as Hollett is not included in any trade, I say you kick the tires on some guys. Everyone can tweet for Durant to re-sign, but the one guy who is in control of that doesn't appear to want him back despite what he says. Get the hashtag #buhbyedarian going! how's the oskee pee wee going these days ? 1) No, You don't get stupid infomercials during NFL broadcasts on TSN. 3) Game 1 of MLS East Conference Final is November 22nd in MTL with Game 2 being November 30th in TOR. And There will be more people in attendance at the Toronto Game than for the Grey Cup being held 3 days prior. Book it. Jones has shown multiple times it doesn't matter what the fans, media, Kerry Joseph want to happen. Jones will do what's best for him and the team. I think DD will eventually take a cut once he sees his value on the open market. look at the stats from 2014-2016. I do not think Jones wants Doubles back either. If he has options available, he should make them public "enquiring minds in Sask want to know". While Guhle and Jones are both possible trade pieces, with the return of both Barzal(Islanders) and Kolesar(injury), Ethen Bear will likely not be going anywhere. Seattle are climbing the standings right now and could be a CHL Top 10 team later in the season. Other guys who could be available though...Evan Fiala out of Spokane. Tough, good skating Sask kid who could be back next season as an overager. Also, Max Lajoie could be available, depending on what the Broncos decide to do this year. Even though they are doing well in the standings, they could move some guys now to build for the future and still compete this season. They could do what the Pats did and be VERY strong in a couple years or so. Brown has been pretty shaky to start. He'll have plenty of time to get back to where he needs to be but, if come January he hasn't been amazing and Hollett isn't the answer, the Pats may be wise to make a move. An elite goalie who will keep the goals against down and another guy for Hollett to learn from could make the Pats and even greater force. I'm not going to give up on Brown yet though, as he has been known to get better as the season goes on and has been very solid in playoff action. Hopefully he can pick it up here. More people are interested in soccer in both Mtl and Tor. Tampering. Is that what you are suggesting? Oh, and it's none of your business what the plans are. MLS is a misnomer and not a real threat to the CFL .. yet. While 55,000 people may attend in Montreal and over 35,000 will attend in Toronto the TV ratings tell a completely different story. Less that 50,000 will watch the game on television. It is a very isolated interest group. I'm with Jones let Durant go. Build the oline let a kid play and grow. Which kid? Until theres a viable young gun, and after the last 2.5 years, the riders still havent produced one, Durant is BY FAR the best option. There isn't enough money in Toronto and Montreal combined to make me attend one of those soccer games. Thxs for proving my theory to be a correct one RP. You're a beaut! Thank you Scruffy, you deserve this. One of the kids on the roster, just like bc did. We don't know what we have till we let them play a whole season. No one in sask knows what we have cause our backups have only played 2 games. Other CHL teams across the country will be upgrading their teams throughout the season. The Pats are currently the number 1 rated team in the country, but if their goal is to win the Memorial Cup, they will need at least 1-2 defense men and an upgrade in net. Tyler Brown is a good goal tender, nobody is saying that he is terrible, but he hasn't played his best hockey yet this season. If he can step it up in a big way, he might be the guy, if not, the Pats will definitely need an upgrade in goal. There's a huge difference between winning a 7 game series in the WHL and winning the Memorial Cup. The difference between the two is the margin of error. It's a lot smaller in the Memorial Cup. In a 7 game series, you can have a bad game or two and still win a series. If you have a bad game or two at the wrong time in the Memorial Cup, it's over. Having a shutdown goaltender is important at the highest level. In fairness, it's not all Browns fault. The style the Pats play isn't helping him out very much. Nor does it help when the Pats skaters let off of the gas. A lot of opponent players are left open in front of the net and are scoring off of one timers, rebounds or off of multiple rebounds (e.g. the third goal in Moose Jaw). It wouldn't hurt if team defense was tightened up a bit. So much for Guhle. He got sent to Prince George today.